Ford's SEMAfication continues, with a set of contract customs focusing on the company's trucks, SUVs and crossovers. It's just the latest example of the marketing juggernaut the massive Las Vegas aftermarket products show has become. Ford's latest include tuner-tart F-150s from ATS Design, K Daddyz Kustoms and its own Ford Vehicle Personalization team, a Lincoln MKX by Barry's Speed Shop, an Escape from FMS, and Edge from MRT-direct and a Lincoln Navigator L from DeBerti. The main event, at least for those left cold by mix-and-match catalog jobs, involves a 1951 F-Series (rendering above) created for the Make-A-Wish foundation. We'll be there, wearing one of those fruit hats like Carmen Miranda. DEARBORN, Mich., Oct. 19 - Ford is blowing the doors off the competition in crossover sales growth this year, with a 52 percent sales increase in 2007 versus last year, but the company is continuing to push the segment's limits at this year's Specialty Equipment Market Association (SEMA) show. Specially tuned and tarted up Ford Edge, Escape and Lincoln MKX models will be featured at the annual aftermarket extravaganza in Las Vegas on Oct. 30. "CUVs continue to be the fastest-growing vehicle segment in the U.S., and we want to make sure buyers know there will be abundant personalization choices for them," said Kim Irwin, vehicle personalization and accessory manager. "By working with some of the best after market up-fitters and customizers, we are offering our Escape, Edge and Lincoln MKX buyers some dramatic interpretations of their vehicles." MRT-Direct ups the "sport" in crossover sport utility with this extremely lowered and lavished Ford Edge. The 3D Carbon body kit is further accentuated with an MRT Leading Edge hood, rear fascia and black chrome exterior trim. The 3.5-liter turbocharged Duratec V-6 uses a Turbonetics air-to-air intercooler, MRT Aero turbine performance exhaust with calibration by Calibrated Success and Ford Racing Performance to drive all four 22-inch Boss Motorsports wheels and Dunlop tires. An H&R Street performance suspension keeps things under control. The performance theme is carried top the interior sporting Sparco Modena sport seats and Stewart Warner gauges. An ARC Audio system supplies the tunes while Ford's exclusive SYNC hands-free communications system lets you keep both hands on the wheel at all times. V-6 while rear seat passengers enjoy INVISON Industries Revolution 2 DVD screens mounted in the headrests. This custom ride could easily be classified as 'dessert.' The delicious interior, bathed in supple Katzkin leather and suede, provides the perfect ambience to enjoy the INVISION Revolution 2 DVD screens in the headrests and Blaupunkt premium audio with 12-inch tube subwoofer. The Lincoln crossover is bathed in luxurious PPG black paint and dressed in a 3D Carbon body kit with custom grille, trim and blacked out tailamps by Barry's Speed Shop. An H&R suspension kit lowers the MKX over a sweet set of SRRC Wheels that show off the Baer Brakes custom rotors. Every trucker has an ultimate obsession. ATS Design partnered with an elite group of aftermarket manufacturers to bring their Ultimate Obsession to life. This radical custom F-150 features a who's who list of brand names from the Volant exhaust and air intake system on the 5.4-liter Triton V-8 to the dual Optima batteries under the hood. ATS provided the front valance, fender flares and roll pan with billet accents along while T-Rex chipped in the billet grille insert. Ford's Cargo Management System sits atop a Wise Industries bed rug and snuggles underneath the Snug Top tonneau cover. A McGaughy's suspension drops the truck two-inches over 22-inch KMC Lorenzo wheels wrapped in Pirelli rubber. The Katzkin leather interior will be rockin' to the sound of a Sony premium sound system while the little truckers are entertained with the Sony DVD system and monitors. Justin Lilley had a wish. The young cancer patient asked the Make-A-Wish Foundation to help him restore his grandfather's 1951 Ford pickup. Make-A-Wish tapped the talents of the students at Washtenaw Community College in Ann Arbor Mich., with help from Ford Motor Company to perform a complete ground-up restoration. Justin's wish truck sits on a Fat Man tube chassis with a supercharged 4.6-liter V-8 under the fiberglass hood. 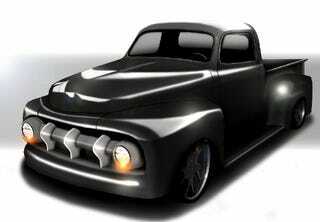 The '51 Ford body is chopped and features suicide doors. The custom deep black paint is carried on to the Ford GT40 wheels. The interior is fitted with a custom dash, console, racing seats and a booming Alpine stereo system with custom speaker boxes. The FX-2 takes trucking to a whole new level and the project FX-2 V2 ups the ante even further. The Vehicle Personalization branded windshield is just a hint of what's in store. Each side of the truck shows off a different set of new 22-inch wheels while the pure white paint is set off with contrasting stripes that run down the hood and across the hard tonneau cover and down the tailgate. Ford Racing provides a supercharger, radiator, chrome valve covers and custom exhaust along with a lowering kit and tall 4:10 final gear for extra get-up-and-go. Red illuminated sill plates provide the invitation to an interior that features headrest DVDs, BaluPunkt audio and HD radio. Cruise the 'hood in style in the Urban Rider from 3D Carbon. The 2008 Expedition is converted to a hip street custom with a new front fascia, side rockers, rear bumper lower valance and rear tailgate spoiler. An Eibach performance suspension sets the Urban Rider down over polished NC-forged, six-spoke aluminum wheels wrapped in Pirelli rubber. A Katzkin two-tone leather interior and tinted windows add the finishing touches. Who says you can't take it with you? This gorgeous black-on-black cruiser is like a luxury getaway, complete with fully reclining back seats that massage you from head to toe. Best yet, this Navigator keeps you connected with a Trac-Vision system by KVH that provides satellite television and internet access. Just sit back in the supple Katzkin leather seats and watch a movie, the game or play a game of your own. The Black L floats on a custom air ride suspension and looks out-of-this-world with deep black PPG paint, 3D Carbon wing, Street Glow under lighting and 26-inch, forged aluminum wheels with polished rims and black spokes. Ford Motor Company, a global automotive industry leader based in Dearborn, Mich., manufactures or distributes automobiles in 200 markets across six continents. With about 260,000 employees and about 100 plants worldwide, the company's core and affiliated automotive brands include Ford, Jaguar, Land Rover, Lincoln, Mercury, Volvo and Mazda. The company provides financial services through Ford Motor Credit Company. For more information regarding Ford's products, please visit www.fordvehicles.com.